This was advertised in the Conservative History Journal but it is really a National Trust Event though a lecture about Disraeli at Hughenden Manor must be of interest to anyone who is interested in conservative history with either a capital or a small c.
Well, actually I do have some more information: tickets cost £40 each but this will include lunch, a copy of Lord Lexden's history of the Primrose League and a "lavishly" illustrated booklet on which his address at the lunch will be based. All that makes it rather good value, especially if I add the information that Lord Lexden is really Alistair Cooke, who knows more about Conservative Party history than any other man alive. Meet at the Anglican Chapel. Nearest Tube: Kensal Green or Ladbroke Grove. Kensal Green Cemetery is one of the so-called Magnificent Seven – cemeteries which were established in London’s suburbs during the Victorian period in the interests of public health. Notable “residents” include the Brunels (pere and fils), Charles Babbage, Anthony Trollope and many others. We have 12 places booked on the official tour run by the Friends of Kensal Green Cemetery. This means that we’ll have access to the fine chapel and also the catacomb, both of which are normally closed to the public. An extra treat for us is that LH member Sue Bailey, who runs the London Cemeteries blog, will be giving her personal tour after FKGC. There are some very good pubs nearby – we’ll repair to one of these afterwards for drinks. £7, to include tea and biscuits, pay on the day. To book your place, please send email to admin@londonhistorians.org with “Kensal Green” in the subject line. Preference will be given to London Historians members in the first instance. I have been round a part of that very large cemetery and can thoroughly recommend the tour. Tory Historian spent the morning at the Tate Gallery or Tate Britain as it is now known and saw The Vorticists exhibition. By no stretch of imagination were the Vorticists conservative but the movement was genuinely exciting and innovative in Britain with real links to Continental art movements (though they refused to be associated with Marinetti and the Futurists). It is, Tory Historian thinks, their refusal to fit in with the rather cosy, attractive and unthreatening modernism of the Bloomsbury Group and surrounding artists together with the soi-disant leader, Wyndham Lewis's hatred for the British Left, the Soviet Union and the Communist fellow travellers that has ensured a certain disdain for him and the group among art critics and historians. 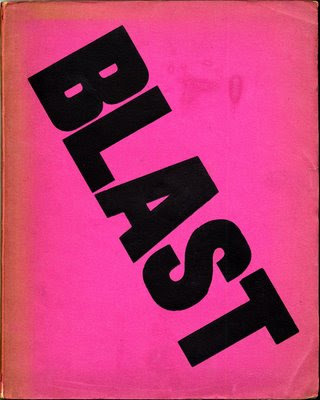 As a matter of fact, Wyndham Lewis was probably the best British portraitist of the twentieth century and, according to T.S.Eliot, a true-blue cultural conservative, the best prose writer of his generation. It is, Tory Historian thinks, time that his star rose again despite the left-wing cultural propaganda that has relegated him to a secondary position for so long. Some time ago The New Culture Forum had a posting about Wyndham Lewis. So there is the charge sheet: Wyndham Lewis dismissed the Bloomsbury Group, opposed the Soviet Union, despised the Communist fellow travellers in the West, was pro-American and was an early supporter of Anglospherist ideas. Definitely a fascist, m’lud. The widespread undermining of Wyndham Lewis’s reputation shows the extent to which the Left has managed to control cultural understanding in Britain. The Vorticists, however, is more than just Lewis. The exhibition tells the story of this short-lived movement together with the various personal friendships, alliances and enmities; it also gives scope to the other artists, some of whom, especially the women (unlike some of the more famous artistic groups, the Vorticists had women members from the beginning) are less well known. For those who are interested in the extraordinarily important ideas that Adam Smith expressed and detailed in The Wealth of Nations but find it a little hard to get through the lengthy original, Tory Historian can recommend the latest publication by the Adam Smith Institute. It is a condensed version of the great work, with a few original quotations as well as some comments and additions that refer to the more modern period by Dr Eamonn Butler. As a special bonus there is also the Incredibly Condensed Theory of Moral Sentiments. It really is incredibly condensed - only seven pages. 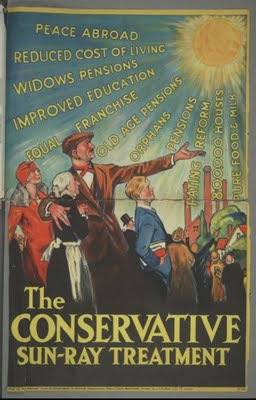 In many ways Tory Historian finds this work of greater interest and value than the better known one. That is an odd title for a posting on the Conservative History blog but, let us not forget, that song is now history, though fairly recent, and Bob Dylan is seen as something of a conservative by many. Anyway, to our muttons: despite my previous postings about the printed version of the Conservative History Journal, its appearance (and a very fine appearance it is, too) has little to do with me. For various reasons of convenience the editorship has passed on to Nigel Fletcher, who is also Director of the Conservative History Group. The new issue has articles about Peel, Disraeli, Sir Stafford Northcote, Churchill and Macmillan. If some of those names sound familiar to readers of the journal, that is not surprising. They are some of the most important names in the history of the Conservative Party. People who have sent me articles will not be short-change, though. For another big change will be taking place almost immediately. This blog (with its secondary cousin, the blog of long articles) is undergoing an important reconstruction and is being turned into a much better and richer site. Thus there will be two outlets of conservative history, which can only be a good thing. We hope that the relationship between the two will be friendlier than that between Peel and Disraeli or Heath and Thatcher. Tory Historian will still be running the blog but there will be other articles posted by various people, including and especially the articles that are already in my folder marked CHJ 2011. I shall also start a more ferocious campaign to make the site better known in conservative and historical circles in this and other countries. Militant conservatism is a formidable thing to behold. Forward to the sunny heights. 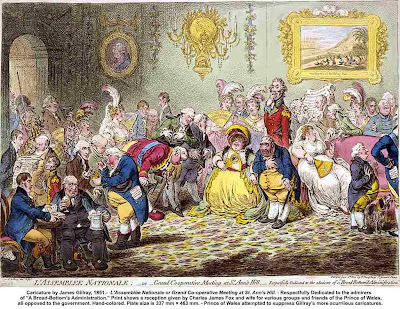 It is surely no secret to anyone who is interested in the politics and satire of the eighteenth and nineteenth centuries that both used to be a good deal nastier and politicians did not complain when they were accused of all sorts of highly unpleasant, anti-social, disgraceful and, sometimes, illegal activity in the most outspoken fashion. The same went for members of society as a whole. One of the funniest and nastiest of cartoonists was James Gillray and the news that the Victoria and Albert Museum has acquired an album of forty "suppressed" cartoons by that master of invective and satire is very good, indeed. An album of 40 ‘suppressed’ cartoons by leading British caricaturist James Gillray (1756-1815) has recently come to light in the Criminal Law Policy Unit of the Ministry of Justice. It features material judged socially unacceptable in the 19th century - including explicitly sexual, scatological and politically outrageous subject matter. The album was probably seized by police more than a century ago as ‘pornographic material’ and handed to Government officials. This slim volume of ‘Curiosa’ has now been transferred to the print collections of the Victoria and Albert Museum, V&A. 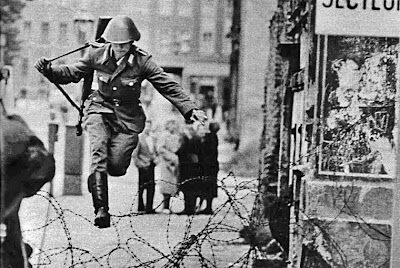 Having seen what was acceptable in those far-off days, Tory Historian is perplexed as to what might have been "unacceptable" enough to have been suppressed and hidden. One can but hope that these "unacceptable" cartoons will be on show though not, perhaps, to politicians who will find them rather unpleasant. And talking of the Victoria and Albert Museum, Tory Historian has also found a note about an exhibition that would have been unthinkable a few decades ago: cartoons and covers from Private Eye on its fiftieth anniversary that is due this autumn. To think that of that naughty satirical magazine that was, for many years, not stocked by W. H. Smith because of fears of libel becoming part of the establishment to the point of being honoured by one of our major museums. How are the mighty fallen. Here is an article in Vanity Fair by Christopher Hitchens. VJ Day was yesterday but Tory Historian was a little busy. Celebration is, therefore, today. 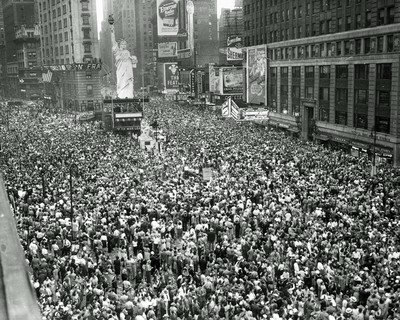 That is what Times Square looked like on August 14, 1945. Berlin Wall, symbol of division between Western and Eastern Europe goes up.